Lokey was born and raised in Bristol. His passion for Graffiti started in the mid 1980’s through a chance meeting in a local park, with some kid’s break-dancing who had returned from their holiday in America with hip-hop mix tapes and photographs of Graffiti. They told him he had to have a street name, a tag, and from that point on he was hooked and after playing about with a few other tag's he became Lokey. 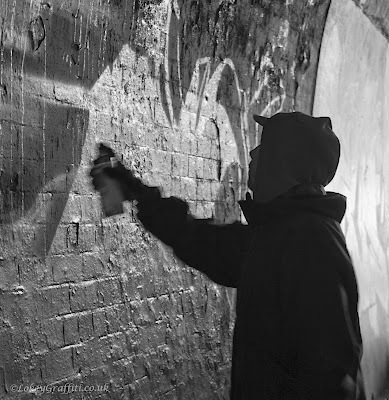 He is the youngest veteran of the Bristol Graffiti Phenomenon, with over 20 years of experience in the once underground scene, which is now very much a part of the day to day lives of Bristolian people. His writing style has progressed, over the years, from simple Bubble letters in the early days, through to Wildstyle and now the 3D lettering, that he is most known for. Lokey has exhibited at numerous galleries across Bristol including at The RWA, Weapon of Choice Gallery, Upfest Gallery, King of Paint, The Farm & The Emporium to name a few... and he has also exhibited as far a field as Abu Dhabi. His main love is painting on walls... the more the merrier and the bigger the better.